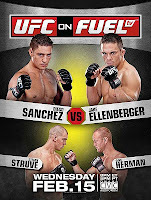 UFC on Fuel TV Sanchez vs Ellenberger Fight Pick | MMA Fighting Events Videos Techniques UFC Fight Picks and News. 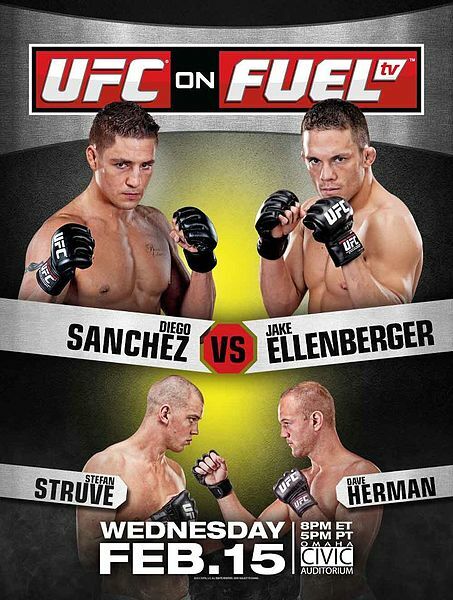 The first UFC event on Fuel TV will take place this evening at the Omaha Civic Auditorium in Omaha, Nebreska. Diego Sanchez vs. Jake Ellenberger will be the main event. Here's a closer look at Sanchez vs. Ellenberger and my fight pick. Diego Sanchez is a tough MMA fighter that's been in the UFC since 2005. Since his time in the UFC, he's only been stopped once. That stoppage came via a TKO (doctors decision) at UFC 107 where he fought BJ Penn. While Diego Sanchez is a true UFC veteran with an overall MMA record of 23-4, he hasn't faired well recently. Sanchez is 2-2 in has last four fights, and 6-4 in his last ten. He's also had trouble finishing fights. Seven of those last ten fights have gone the distance. Jake Ellenberger comes into this UFC fight with an overall MMA record of 26-5. What's more impressive, is that Ellenberger is 9-1 in has last ten fights, with the only loss in the stretch coming to UFC interim welterweight champion Carlos Condit. Since that decision loss to Condit, he's racked up 5 wins in a row, with four of those coming by way of KO or TKO. Diego Sanchez has the experience and is tough enough to hang in there with Jake Ellenbeger, but unfortunately for Sanchez, Ellenberger is the better MMA fighter right now. His stand up and finishing ability will make the difference. Sanchez won't go easily, but look for Ellenberger to dominate the stand up and pull off the victory late in the fight. That's my fight pick! What's yours?